I met Geoff Mitchell when I was twelve years old. From the first day of my first clinic with Geoff at the Chatham Club, I felt right at home with him and his approach to coaching. As a relative newcomer to junior squash, I was in serious need of acquiring technical skills, and Geoff brought me along quickly. But, unlike some coaches I encountered during summer camps, Geoff did not try to force me to play like everyone else. While he encouraged, and demanded, good form, proper footwork, the need for drilling, and all of the classic elements of training, he did not discourage the parts of my game that were more uniquely me. Even more importantly, while he never let us forget that winning was a goal, it was never more important than sportsmanship and friendship. I met a lot of coaches during my years in the junior squash world, but no one ever did-or ever could-replace Geoff. Many good squash teaching professionals come and go, but there are few like Geoff Mitchell and the Mitchell Squash Program. For over twenty years, he has given students more than just the tools to be accomplished squash players at the elite, high school, or club level. He builds character and leadership skills in a family oriented environment. Coaching squash at the collegiate level for over ten years, I can always tell a player who has been involved in Geoff’s program. They play with passion and respect for the game of squash. They exhibit sportsmanship and character regardless of the result on the court. I have had many of Geoff’s players on my teams. They are truly passionate about squash, have strong stroke mechanics, and sound strategic understanding of the game of squash. More importantly, they have evolved into my team leaders, and role models for my younger players. They know Geoff Mitchell and the Mitchell Squash family will always be there for them. To say that Geoff Mitchell has coached innumerable national junior squash champions is only half the story. Yes, Geoff has been with young men and women from the moment they first picked up a squash racquet when their ages were measured in single digits. And yes, Geoff has watched them become national junior champions and go on to college team captaincies and All American selections at Harvard, Yale, Princeton and virtually every other national; squash power. But that is only half the story. Geoff is a mentor, friend and role model to young people in their teenage years. All parents want their children to make the right personal choices and be motivated to achieve the best that is in them. Geoff served as our son’s older brother. All teenagers are exposed to risky behaviors. Geoff’s influence gave us the confidence that our son and his merry band of squash friends from the Chatham Club would make the right choices. Geoff taught our son squash — and so much more. Like so many others, our family owes a huge debt of gratitude to Geoff Mitchell. Both of our children trained with Geoff, both benefited from his technical expertise and superior teaching ability, and both went on to play varsity squash at Yale. In the U.S. junior squash world and beyond, Geoff’s coaching abilities are well known and respected. But those who have not had the pleasure of working with Geoff might not know of his many other personal attributes. Geoff is a knowledgeable, insightful man who brings those qualities with him on the squash court, in coaching at tournaments, and in the many exchanges, both routine and pivotal, that he has with his students and their parents. That is why he is so successful in mentoring youth of differing athletic talents, personalities, and interests. Geoff knows that there is more to life than a junior ranking, and those interacting with him enjoy the benefit of consistent exposure to lifelong lessons-the value of a good work ethic, the importance of civility in one’s treatment of others, good sportsmanship, the need to develop good fitness and nutrition habits, and that losses sometimes teach us more than wins. 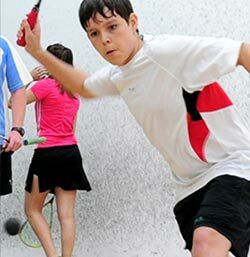 I have two children who have participated in the Mitchell Squash program over the last 12 years. I cannot speak highly enough of the quality of instruction provided by the entire staff. Due to the training they received, both of my children competed in national tournaments and were ranked for many years and had the opportunity to play college squash. Aside from the quality of the technical instruction, I feel very strongly that the association, on a personal level with Geoff Mitchell and all of his staff, was very valuable in developing personal traits of sportsmanship, work ethic, and the concept that sports should be played for enjoyment. 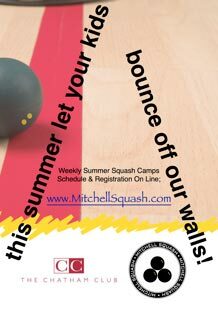 I do not believe there is another program in the area which has produced as many ranked junior players or which can offer all the benefits that Mitchell Squash does. I have known Geoff Mitchell for over 20 years. We have coached at the Heights Casino and taken kids on many oversea squash training trips. Being a college coach for over 24 years had afforded me the opportunity to interact with almost every coach / pro in the US and Canada. I can affirm that Geoff is one of the best teaching pros in the country. Geoff has produced some of the best junior players in the country over the years. But what make Geoff Mitchell stands out amongst some of the best coaches, is his insistence on character and integrity as an athlete and individual. It is not just about winning , rankings and getting into a prestigious college. If you want your son or daughter to learn the game the right way and be the best that he or she can be on and off the court. Seek out Geoff Mitchell at the Chatham Club in New Jersey. Any number of college coaches, parents or students of Geoff Mitchell can confirm his excellence as one of the penultimate junior squash coaches in this country. Coaches know the product they are getting from a Mitchell Squash student, both on and off the court. 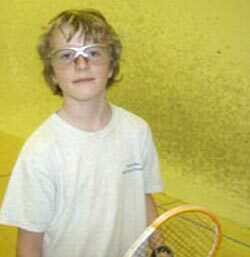 Both of my children started to play squash as ninth graders. Rather late for a youngster to begin this arduous sport. Between the two they attained a college captaincy, an All American commendation, a couple of team national championships, a top 10 national junior ranking to name a few. I attribute their success not only to what they learned on the court, but also to what Geoff teaches them off the court. Take the refs decision without complaint and play on, let the other player act out on court while you keep your cool, understanding that respecting yourself and your opponent is the Mitchell way, depend on yourself to figure out strategy in matches based on your instruction, not needing a coach there every minute to tell you what to do-you only learn from your mistakes–and to play tough but fair. No primadonna attitude is acceptable. You get out of it what you put into it. Valuable life lessons indeed. One final note. In my present career as a college counselor, I can tell you from experience, that college coaches accept Geoff’s word at face value and they understand that when they get a Geoff Mitchell product, they get not only a great squash player, but a fine individual as well. Today, for the first time, I was a real squash player. My coach today was more proud of me for losing than for winning. The entire club congratulated me on really becoming more than a squash player. Yes, I have been a squash player for a couple years now, but today I became a squash player. There’s more to a player than meets the eye. Most people are probably wondering what’s the difference between a squash player and a squash player. A regular squash player plays the game and just does it. Today I lost with a smile on my face and yes I am smiling because I lost. Winning isn’t everything and in my opinion losing is everything. Most times if you don’t win a game or match, your opponent didn’t win, you lost. Today that wasn’t the case, I am proud to say. Let me explain. Today I played a match against a girl named Lindsay in my squash class. My coach loves pairing me with Lindsay because we are so similar in our game and in our personalities. If you ever watch a game between us, you would see almost every rally we complement on each other’s shots and give constructive criticism. Squash may only be played between two players, but my class is a team. We are actually called the 2016 team because most of us graduate high school in 2016. She beat me in two games, in both I lost 11-9. That score is not only close, but it just shows how much we are similar. When I walked of the court to go tell my coach, I walked with a smile on my face. When he sees me he asks did you win. I reply saying no and he right away asks why I am smiling. I tell him, quote, “I might not have won, but I didn’t lose. I played some of my best squash I could that match and we all know that.” I start walking away and I turn around to say one last thing. I told him, “I didn’t win, but that was the most fun game of squash I ever played.” I had this entire conversation in front of an entire group of people; they all agreed that what I said was one of the most influential things I ever told anyone. These people have known me since I was seven. The members of this club are my extended family. My coach, the head coaches, and all of the other coaches were more proud of me for saying what I said than anything else. Not even winning the nationals would have put a bigger smile on my coaches’ face than I saw today. Today I became a squash player. PLAY HARD. PLAY SMART. PLAY SQUASH. I play squash at The Chatham Club. It’s a private club, with very few members. Everyone knows everyone and no one is ever alone there. The Chatham Club is my extended family and they always support me just like my family does. They cheer for me, they help through situations, and they always are more than willing to help me. I will never leave The Chatham Club as long as I don’t have to.